Update: My ebook has now been released and a free sample is available…. To get your free sample click the link below and then on the iTunes Preview page click the link “View in iTunes”. This will launch iTunes. You will then have the option to download the free sample of the ebook. I hope you enjoy it. Thanks for your support. Hi, I’m just putting the finishing touches to my new ebook on Newton’s third law of motion. The ebook will be available for iPhone, iPod touch and iPad through the iTunes Store. 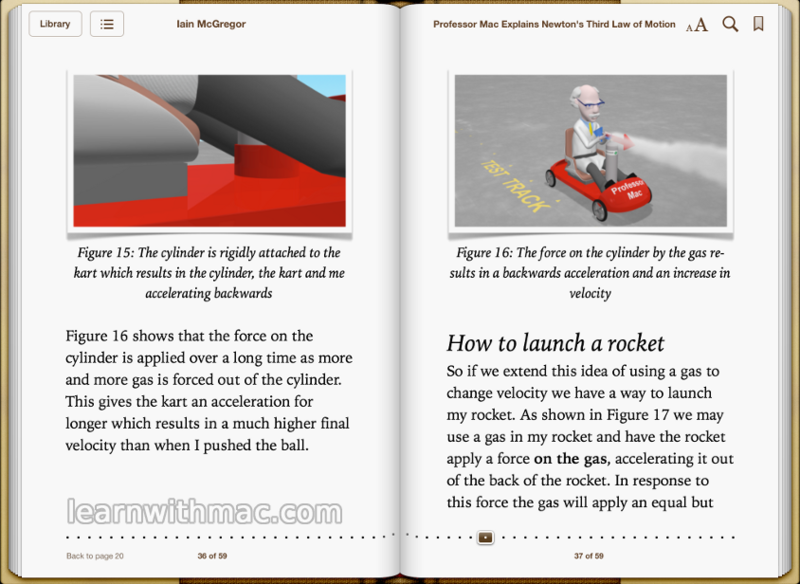 The ebook contains a combination of high quality video and images to explain action and reaction forces and how to use Newton’s third law of motion to accelerate a kart and launch a rocket high into the sky. Do you know how a rocket launches? How do rocket gases accelerate the rocket? Does the ground need to be below the rocket for the rocket to fly? How is it possible for a ball to accelerate a kart with me sitting in it? Can you explain why action and reaction forces don’t cancel each other when analysing the forces on an object? Well join me to find out. It’s all in my ebook in glorious colour and high quality animation. Here is a screen shot from the ebook as displayed on an iPad. The ebook also looks great on an iPhone or iPod touch. Keep an eye out here on my blog for the launch date or keep an eye on my Facebook page to be notified as soon as it is released.